↑ Australian Bureau of Statistics (25 October 2007). 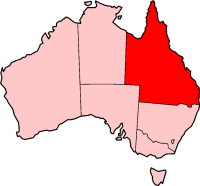 "QLD". 2006 Census QuickStats. http://www.censusdata.abs.gov.au/ABSNavigation/prenav/LocationSearch?collection=Census&period=2006&areacode=3&producttype=QuickStats&breadcrumb=PL&action=401. Retrieved 16 June 2012. ↑ "Queensland - Floral Emblems - Australian Plant Information". anbg.gov.au. 2013. http://www.anbg.gov.au/emblems/qld.emblem.html. Retrieved 31 May 2013. ↑ "Animal (faunal) emblem". qld.gov.au. 2012. http://www.qld.gov.au/about/how-government-works/flags-emblems-icons/animal-emblem/. Retrieved 16 June 2012. ↑ "Bird emblem". qld.gov.au. 2012. http://www.qld.gov.au/about/how-government-works/flags-emblems-icons/bird-emblem/. Retrieved 16 June 2012. ↑ "Aquatic emblem". qld.gov.au. 2012. http://www.qld.gov.au/about/how-government-works/flags-emblems-icons/aquatic-emblem/. Retrieved 16 June 2012. "Anemone Fish (Amphiprion akindynos)"
↑ "State gem". qld.gov.au. 17 November 2011. http://www.qld.gov.au/about/how-government-works/flags-emblems-icons/state-gem/. Retrieved 16 June 2012. This page was last changed on 30 May 2013, at 22:18.